Another week, another set of great deals! Loads of paper in this one, it's a great time to stock up! And of course the Clearance Rack is always around too for more deals! I still have enough stuff to make at least 5 more cards, so I'll probably post some more! Don't forget you only have about a week left to get a free set of markers when you subscribe to My Paper Pumpkin! I wanted to share this video because I'm loving this months My Paper Pumpkin Kit! They've really stepped it up with what's included in the kits the last couple of months, and I'm so happy to see that. 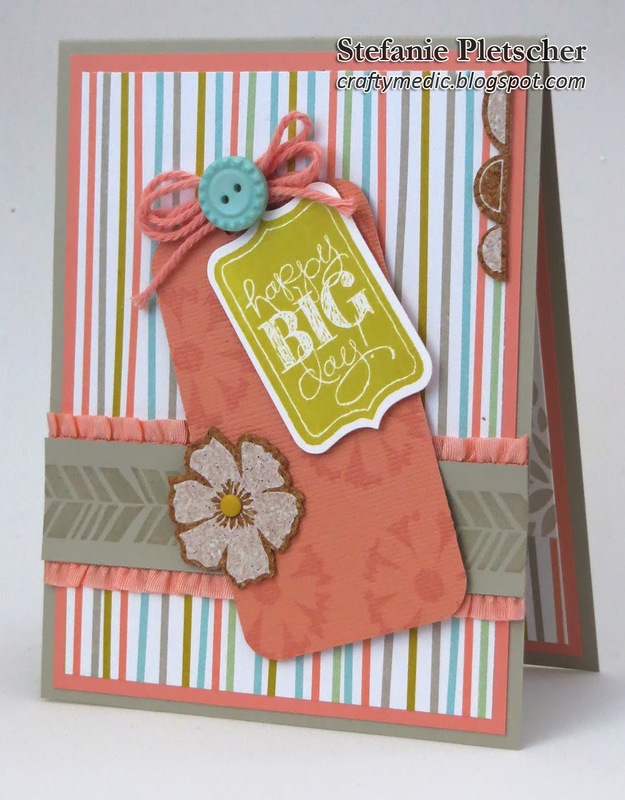 This kit includes supplies to make 8 cards, and some really cool embellishments. Check back later in the month to see what else I do with mine, and if you're interested, you can subscribe yourself to receive a welcome kit next month and then a surprise kit a month after that. You can stop or pause your subscription any time, will get a free clear block to use with you kits, and until the end of the month, a free set of In Colors markers as well! Make sure I'm listed as your demonstrator and you'll also get a gift from me, as well as my monthly newsletter with My Paper Pumpkin specific ideas and inspiration. Don't forget to check out the clearance rack while you're over at the store for more great deals on retired products! 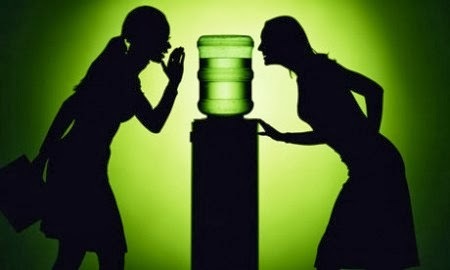 Welcome to my stop on the March Wacky Watercooler Blog Hop! If you're new to my blog you've probably come over from Gail's blog, and welcome! 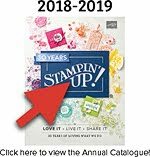 For those that are new to blog hops, you can go forward and backward using the water cooler buttons at the bottom of this post to check out the 15 lovely ladies around the world that have put up posts featuring a smorgasbord of Stampin' Up! products and projects. My first project is using some designer series paper (DSP) that I just love. When I first saw the new occasions catalogue, the whole Retro Fresh collection just jumped out at me as something I had to have, and I've finally gotten around to using it in the last little bit. This card features one of my favourite pieces of DSP from the collection. It's a pretty strong pattern, so I didn't want to overwhelm with too much stamping and embellishments, so I kept it fairly simple. One of the things I love to do with all my cards, and I often forget to show, is do something on the inside too. Not only does it make the card more interesting, but it helps it stand up on it's own too by adding some extra weight to the back half! I usually just use scraps of DSP and card stock to keep it clean enough to write on, but still special. Last but not least, here's a photo to show of some of the awesome dimension I got using well... Stampin' Dimensionals! I love how the wooden arrow embellishment pops up and over the DSP, and you can never go wrong with candy dots to match. My second project features some more designer series paper (DSP) I love. This time I used the Watercolor Wonder collection to make this bright and cheery birthday card. 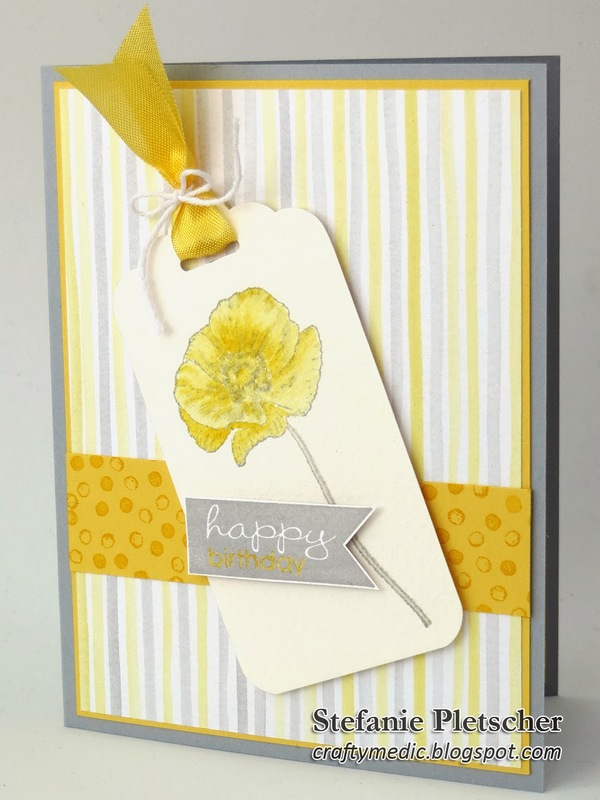 I watercolored the flower with a blender pen and popped the tag (made with the new Scallop Tag Topper Punch) up on dimensionals. Because why not! Once again, I decorated the inside to match the outside. A little simpler this time, but this is one of my go to layouts for the inside of cards that have DSP on the outside. And a little detail because I love this banner set and finally tried using a marker to colour in some of the lettering. I love how it turned out! So pop on over to the next blog on the hop (KatheD) and check out the rest of the stops along the way! 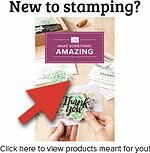 If you'd like to buy any of the products featured in my card, or anyone else's project, get in touch with any Stampin' Up! Demonstrator to place an order. Here's this weeks deals! Don't forget to check out the clearance rack while you're over at the store for more great deals on retired products! You can't see it well in the photo, but I also used Shimmery White paper to give it that extra pop. 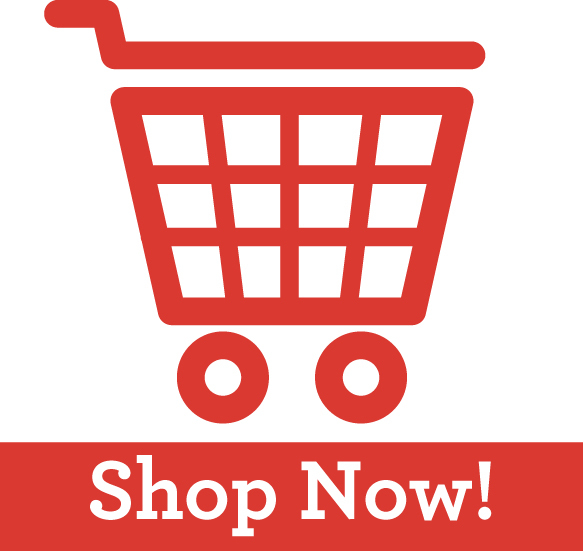 You can purchase that paper, and any current products, my visiting my online store. Make sure you come check out the hop on March 13-15th, and stick around and sometime in the near future you might just get a chance to win that stamp set! This card is made of pieces from the Good As Gold Card Kit that can be earned for free during Sale-A-Bration. I cut apart the card bases to get more milage out of the fabulous print (complete with gold leafing). 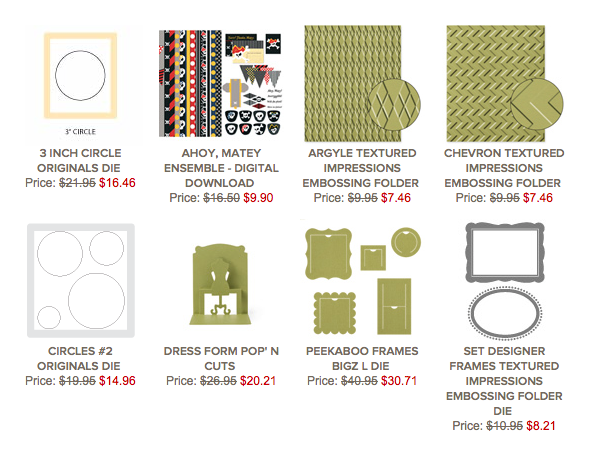 There's more than enough pieces in the kit to make a ton of cards, and I've seen some great projects on pinterest using this kit. You can get this kit in one of two ways, either you can visit my online store and make a purchase of $60 or more, or you can win it! To win it, leave a comment with which of the birthday cards I've been featuring over the last month is your favourite, and you might be the recipient of the Good As Gold kit! This giveaway is only available to those with a Canadian delivery address. Stamp the sentiment from “Itty Bitty Banners” with Stazon ink on white cardstock. Adhere the black card stock layer to the front of your folded card (note that there are several color options). Adhere the white layer to the inside of the card. Punch a flagged end into the black cardstock strip by putting just the end into the punch. Pick your banner pieces (again, there are choices of colors here, ignore the sentiments) and adhere them to the Designer Series Paper piece and inside of your card. Make sure you take out the star from the gold piece and adhere it to the inside of your card. Wrap the twines around the front of your card, using glue dots to secure the bow where you want it. Adhere the DSP/banner layer to the front of your card using dimensionals. 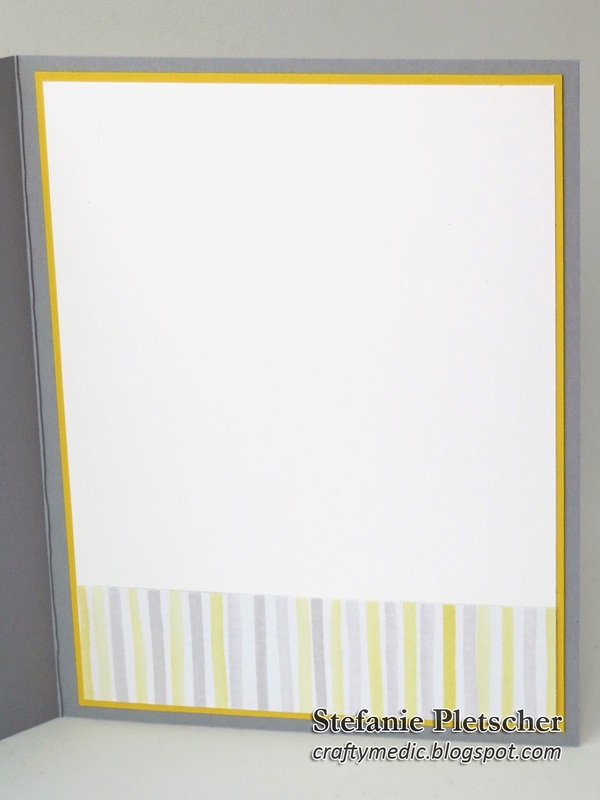 Adhere the sentiment banner to the front of your card using dimensionals. Make sure to cover up the pre printed sentiment and twines. Adhere two candy dots to the front of the card. Pick any color that coordinates. I'm super excited to be able to take part in the Wacky Watercooler Blog Hop in March! A blog hop is a series of people with blogs (in this case there's 15 of us from Canada, the US, and Germany) who all post on the same days, linking to each other in a giant circle. So come March 13, 14, and 15th, you'll be able to stop by any one of the blogs featured and click around to see 15 fabulous projects each day (45 all together over the three days). In the mean time, stop by the main page to check out some of the previous hops and the participating bloggers. I hope you're as excited as I am! This card is CASEd from the always inspiring Dawn Olchefske. I wish I could say I changed it up a bit... but I didn't, the card was pretty much perfect the way it was. Adhere the white layer to the side of the silver layer. Die cut the card base by threading the silver/white cardstock through the Circle Card framelit and putting it through the Big Shot. Ask for a demo if you’re not sure how to do this. 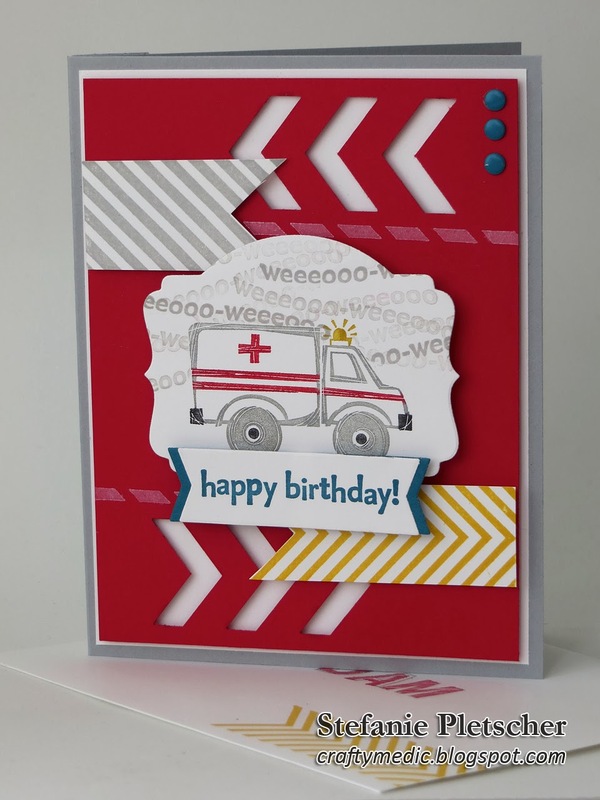 Die cut the chevrons from black cardstock. Die cut the “yay” from red card stock. Punch four small circles and two large circles from black card stock. Punch two small circles from white card stock and then punch two medium circles over them to create a ‘donut’. Pierce the small black circles and insert brads, clipping the overhanging ends with the craft and rubber scissors. 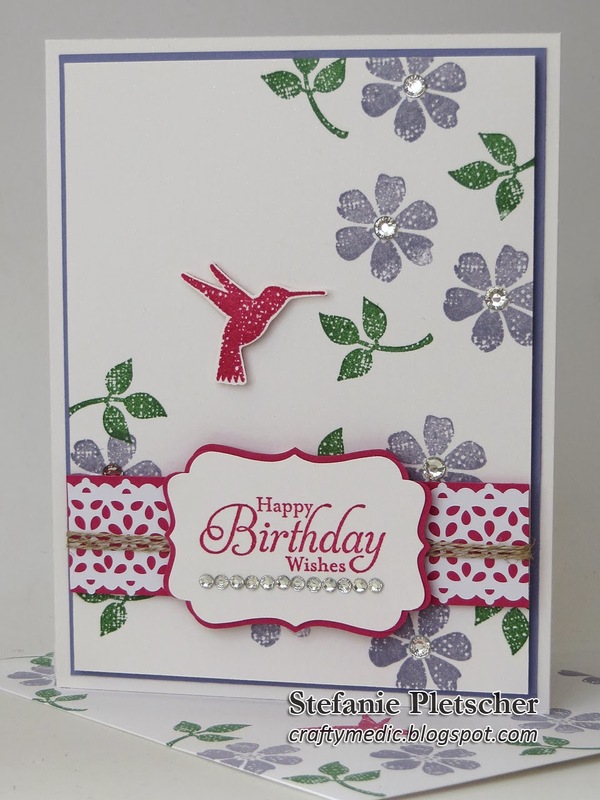 Using Stazon ink, stamp the sentiment from the “Bombs Away Birthday” and music notes on the card. Adhere the chevrons, “yay”, and circles to the card. Use glue dots for the circles with brads. 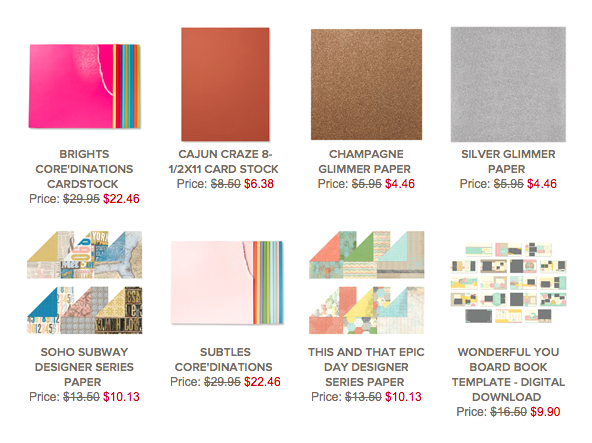 Another week, another set of awesome deals! 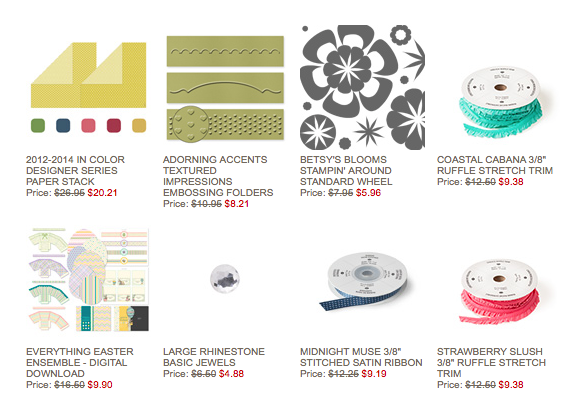 Go to the online store to order these or any of the other current Stampin' Up! products. Don't forget to check out the clearance rack while you're there to get amazing deals on some retired product too! Yes, you've seen this card before. But I wanted to share it once more with instructions. 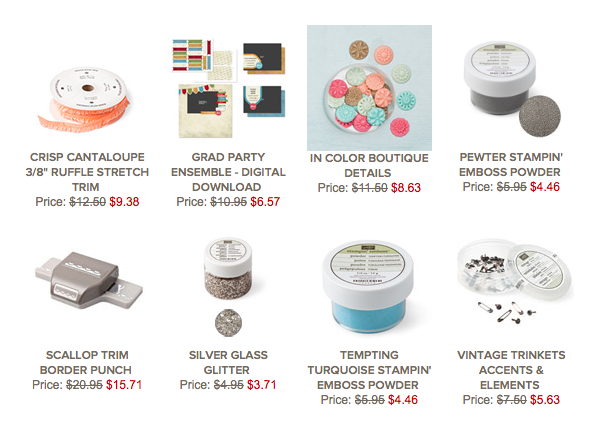 I'm so very fond of the Sale-A-Bration goodies this year, and every time I look I like them even more. Contact me today to find out how you can get your hands on them for free! 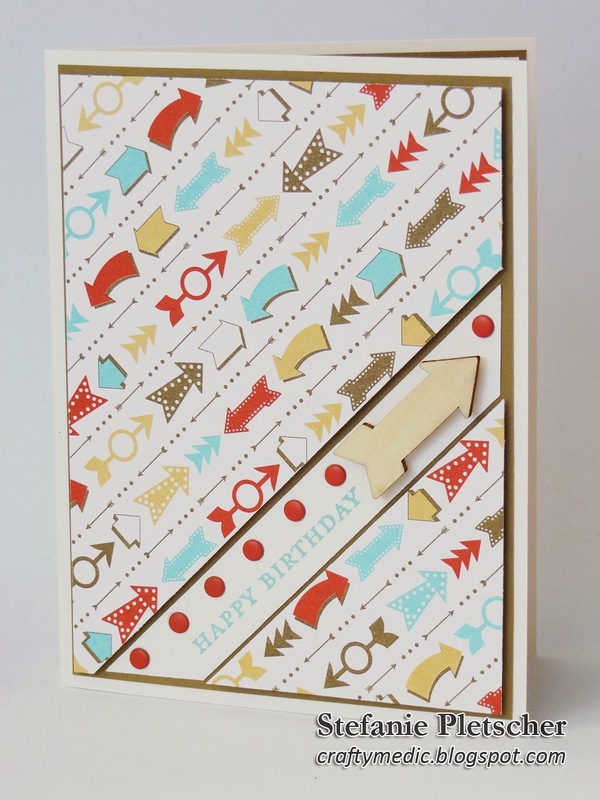 Punch the Core-dinations piece using the scallop tag punch and the corner rounder from the envelope punch board. Stamp the flower from “Petal Parade” on the tag using Crisp Cantaloupe ink. Using Sarah Sand ink and the Stamp-a-ma-jig, stamp the Sarah Sand strip and white panel. Stamp the sentiment from “Chalk Talk” in Summer Starfruit on white cardstock. Adhere the Crisp Cantaloupe layers to the front and inside of the card. Adhere the white stamped layer to the inside of the card, and the Designer Series Paper strip to it. Adhere the DSP layer to the card front. Adhere ruffled ribbon strips to the Sarah Sand strip using sticky strip. Adhere the Sarah Sand/ribbon strip to the front of the card using sticky strip. Adhere the tag to the card front using dimensionals. Adhere the sentiment to the card front using dimensionals. Adhere the bow and button to the card front using glue dots. 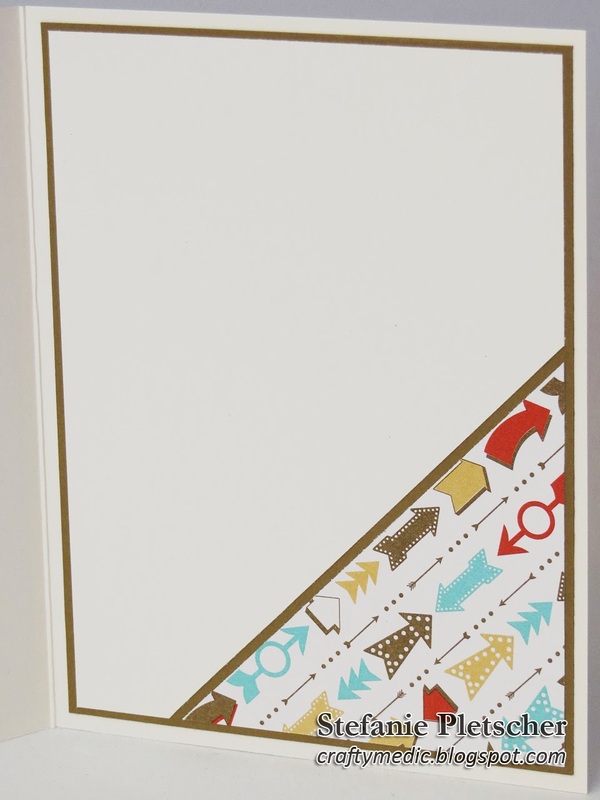 Adhere cork embellishments and candy dots to the card front. I don't talk much about my day job on here, but I thought I'd share a little today. We spend a lot of time working, and waiting, with our partners at work. Having one you like and work well with is a huge deal. At my station we spend any where from 10 to 24 (or more) hours together, eating, sleeping, watching TV, and of course, in the ambulance and doing calls. The calls range from people who really could have taken themselves to the hospital (or don't need to go at all) to scenes most people couldn't imagine in their worst nightmares. Because I'm a casual employee (who works full time hours), I don't have a regular partner, and work with a lot of different people. Some are great, we have an awesome time, and leave work with a smile. Others... not so much. This card is for one of the good ones.